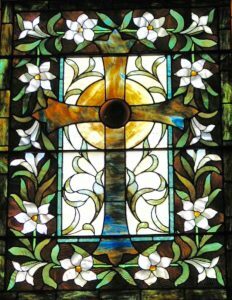 The Sanctuary of St. Peter’s holds great meaning for the parish of St. Peter’s with lovely stained glass windows, carved wooden paneling and pews, and may be accessed either through the steps leading up to the narthex, or through the ground level entrance. St. Peter’s Sanctuary is handicapped accessible with an elevator located on the ground floor. Worship is central to our life as a Christian community here at St. Peter’s Church and we provide several differing styles of services to appeal to a wide range of people. On Sunday morning at 9:00 a.m. we celebrate Holy Eucharist Rite II a modern English vernacular service with music.